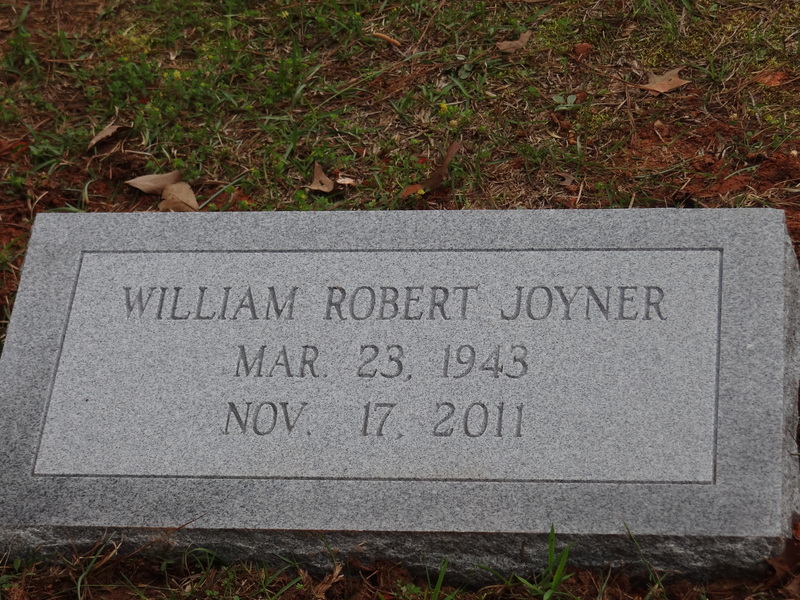 This is the eulogy I gave at my Daddy’s service at Little Union Primitive Baptist Church in Crawford County, Georgia on 19 November 2011 at 11:30 a.m. RIP William Robert Joyner, 23 March 1943-17 November 2011. Daddy asked me 18 months ago to speak today. I do try to do what my Daddy tells me to, so here I am. I have thought about this off and on that whole time. What would I say? What can I possibly share that would honor the precious human being who lived and loved with us? Well, I told him I would. So I’m going to try. But it would take a wordsmith like Daddy to really do this right. Mama and Daddy met 44 years ago, when Uncle Chesh shared some of Daddy’s writings with her. The first time she met him she said, “I could fall madly in love with you Mr. Joyner.” And so it was for both of them—love. Mama and Daddy married, and I came along almost a year later. When I was born healthy, this very young couple lived and saved so they could give money to the Pearl S Buck Foundation to help other children. They lived simply. Daddy taught us to appreciate what we had, and to give back to others. To be good stewards—of our home, of the things we have, of our world, and of others. Over the years, he and Mama have touched many lives through their giving and helping out folks. One day when Daddy was driving home from work, he heard “Go Rest High on That Mountain” on the St. Jude Radiothon, came home, and asked Mama to call and make a donation. As they sat in different doctors’ offices over the past over the past three years, they thought about those children and continued to give. Daddy was all about substance over form. He expected the best out of us all, and he loved us even when we fell short. Grace. Daddy was full of grace. He loved wood and tools and making them work together to create. He loved words and thoughts and cogitatin’ and metacognition. He loved Mustangs. He used to carry Taite through the parking lot at Stevi B’s and look for Mustangs if they finished eating before the rest of us. He also loved the musical Cats. He could put many a child to sleep curled in his chair with him watching Cats. He loved music—many different kinds. He especially enjoyed Steve Earle, and he was known to loan his CD out to different fellas we girls brought home. I think it might have been some kind of test. He instilled in me and the next generation a love of Elvis and the Beatles. He loved Matchbox cars, model cars, children’s books, and playing with his grandchildren. He loved learning and reading and was curious about the world. Once he set up a camera in the yard and videotaped wasps. He was fascinated. He was fascinating. Daddy knew the difference between right and wrong. He made sure we knew it too. From that finger that got a mile long when he pointed it at you to “going to the woods to eat worms” to “taking a walk and going to the yelling tree,” he encouraged children and grandchildren to act like they were somebody. I asked him once if he thought it would be okay for me to go dig up a little pine tree on a lot folks were building on—I figured it was going to get run over by equipment anyway. He said, “Is that your tree? Is that your property?” Enough said. Okay then. Daddy had a great sense of humor. Like the time he videoed Jim playing basketball and narrated, “Jim is going to shoot a basket. Oh no, he missed!” Or when Ben was standing under the mistletoe hanging at our back door, and he jokingly threw his arms out and said, “Uncle Bill!” and Daddy quickly walked over and gave Ben a big ol’ smooch. Or when years ago he sat by the door when Uncle Bob brought Aunt Jewell back from a date and he was cleaning his sawed off shotgun. Or how, when he was bringing Mama home to meet the family for the first time, he wrote them a letter talking about this little puppy he was bringing home who had been tagging along with him at school. They weren’t sure if it was a real puppy or a girl, so I think they were prepared for both. He loved this family. Whether it was taking off from work to meet Mama when Sandy had to get her shots, teaching her “don’t look,” or giving Lee his chess pieces to play with in the hospital, or letting his baby sister curl up to read with him on his bed, we—all of us—were his priority. He was a brother, a Daddy, an uncle, a granddaddy, our Cap, and a husband and best friend. Daddy was an encourager. He told us we could do anything if we set our minds to it. He was a disciplinarian too. When I was a teenager, he asked me if I’d done all the trimming work on the yard, and I said, Well of course. He asked me if I was prepared to cut the grass with scissors if he found some not cut. Sure, I told him rather flippantly. Sure enough, I wound up cutting a triangle area with scissors. I got the blisters to prove it, but I didn’t do that again. Daddy loved Mama’s cooking and Stevi B’s. He loved teacakes, peanut butter on anything, and caramel cake. He loved ice cream and Fuji Apples. And he loved feeding babies vanilla wafers and jacking Auburn’s oreos. Daddy loved stories. He loved hearing them and he loved sharing them. Stories about the past—about all the folks who went before us, and stories about his growing up…..like the one about the possum being kept in the 55 gallon drum on the porch to clean him out for eating…..and who mysteriously escaped when someone tipped the drum over…..or how, when he was little, they dug holes in the yard and pulled grass to line the hole, and that was their Easter basket. Or the story about the argyle socks Grandmama gave him for Christmas when he was a teenager or when he and Uncle Dan packed to run away because they saw Granny disciplining one of the puppies she was raising. Over the years he loved hearing your stories too, and even more so in the recent months. He loved to share your stories and the stories about your children and grandchildren with me that you shared when you came. Daddy taught us many lessons. He taught Jim to garden first with a shovel—if a job is worth doing, it’s worth doing right, even when it’s hard. He and Mama taught us what those marriage vows look like in real life. He taught us that if we ever questioned our priorities to look at these precious little ones around us that he loved so much, who brought smiles to his face no matter how much he was hurting—that’s where he wanted us to focus. He taught us to fight hard when it matters. One time when Daddy was at Emory, he told me the story of a couple whose vehicle (and the trailer behind) was broken down on Houser’s Mill Road. He went to help them. He said it was bad—bad vehicle trouble, no money, problems all over the place. He said the man just sat there and wanted to give up. And Daddy asked me, “How do you just give up?” Daddy didn’t. He didn’t give up on any of us, and he didn’t give up on this fight either. He was brave and strong through it all. And Mama has been too. They’re my heroes. Daddy’s heart was big. He made himself interruptible for any of us who needed him—anytime for anything. And when he needed help and prayers, you all made yourself interruptible and available for whatever was needed. Visits, grocery store trips, coming to help with a moment’s notice, cooking, baking, a listening ear, drying tears, help when he just couldn’t get back up, fixing things around the house, driving to doctor’s appointments and treatments, prayers, and hugs for his family. You all, this community and friends around the world, travelled this long journey with him and us—making yourself present for whatever was needed. For that we are all so thankful. There is a song that I’m going to borrow from and change a word or two. Two days ago I was so blessed to be present with beautiful, strong women as we gathered to be with this man whom I adore, as he left the pain and brokenness. Mama said a prayer of thanksgiving for Daddy being in our lives. There were moments of joy—celebrating his life, and there were tears. But the tears were also a celebration. Know this, the tears speak to the depth of our love for him and his for us. They are precious, silent prayers of gratitude streaming down our faces. The world has lost a great man but WE have not. For as long as we share his stories and our stories, his love of all God’s creation, especially his heart for others, he is with us. Share your stories and your love with others and change the world. I know my Daddy did.